New York - In three short years, Schema-Igumen Fr. 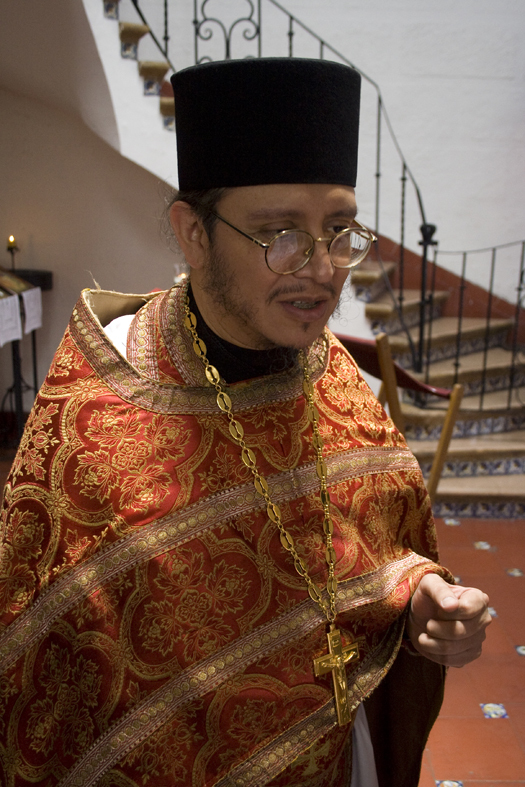 Nektariy (Haji-Petropoulos) founded the first Russian Orthodox monastery in Mexico and created the first Russian Orthodox Community. A quiet and thoughtful person, the abbot prefers to spend time away from the bustle of the world. His lifelong dream was to lead the secluded life of a simple monk. Instead, he found a great responsibility resting on his shoulders: the management of a monastery with two other monks and the care of hundreds of human souls. Fr. Nektariy always knew he wanted to become a monk. As a little boy, he often begged to go to church and played at serving Liturgy at home. He was an only child, and his mother wanted him to marry. But his mother’s wish came true. Fr. Nektairy has hundreds of spiritual children – over 150 families. "IT IS MY SACRED OBLIGATION TO PROTECT THESE PEOPLE..."
Though he doesn’t have a drop of Russian blood and has spent most of his life serving in Greek churches, he became the center of the tightly knit Russian community that has developed under his care. As a monk, he spent six months at the Holy Trinity Monastery in Jordanville, NY, and considers himself a Russian priest. His parishioners agree. “The local Russian Diaspora revolves around him. Many trust him above anyone else and consider him a spiritual guide,” says parishioner Sergei Alexeev, 32. 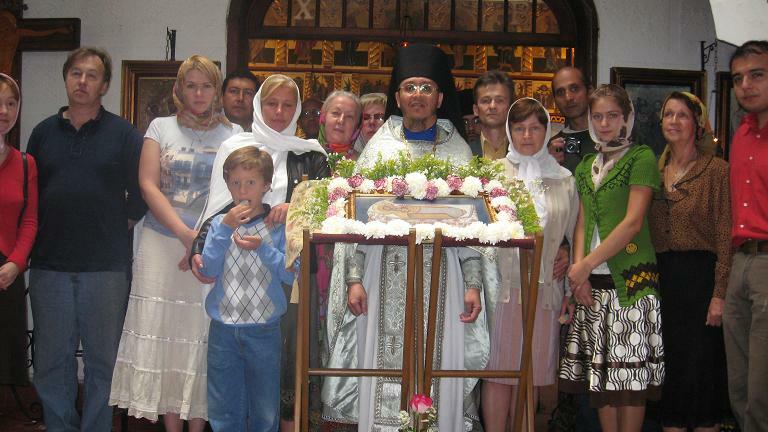 Most of his parishioners are Russian women married to Mexicans, who are usually non-believers. Some of them met on the internet and “ended up having a miserable life,” says Fr. Nektariy. When their husbands beat them and take away their passports, these women go to the only person they know will be able to help. The right path however is rarely easy. Since the very beginning, the skete has been struggling financially. The worst came after the swine-flu epidemic in 2009, when the monastery had to shut down their bakery and coffee shop – their main source of income. The brethren still bake for loyal customers, but do not make enough money to open another café. The skete needs money for rent of church property and a car to help the abbot make his daily commute to work at a local university. Most parishioners are struggling emigrants and are often unable to help. Fr. Nektariy doesn’t even hold a Sunday collection plate. He says, if people have some money, they will share without him having to ask. As time-consuming as a large parish is, it is only a part of Fr. Nektariy’s busy life. His regular day begins at 4:30 a.m. with long services – the Midnight Office with Matins, the Liturgy three times a week, Vespers and Compline services – and comprises daily lectures on Art History at Iberoamericana University, long meetings with spiritual children, visiting the sick, fulfilling treby (requests for prayers or rites), and preparation for the next day’s lectures. This is all in addition to regular visits to other Russian communities in Mexico. The abbot sleeps no more than 4 and a half hours a night. In the last couple of years, his health has started to give way. His aching knees prevent him from taking a bus to the university – it is excruciatingly painful for him to climb the stairs. Three times a week, the abbot goes to see a doctor with such problems as kidney stones and diverticulitis – painful internal inflammation. He cannot afford medical insurance. Fr. Nektariy is still young, but is forced to use a walking stick. Despite all of this, no one has ever heard him complain. “He never talks about his personal troubles, but we know that he has health troubles and try to help,” says Sergei Alexeev. Fr. Nektariy shows more concern about the health of his parish and the fact that the monastery doesn’t have a refectory to seat all parishioners on Sunday. He prefers not to dwell on difficulties. He admits that his parishioners mean everything to him, and they respond with the same affection and love. Please assist Hegumen Nektariy and the Holy Trinity Skete in Mexico City! 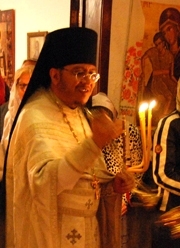 "I will protect my parishioners no matter what..." - an interview with Schema-Hegumen Nektariy.